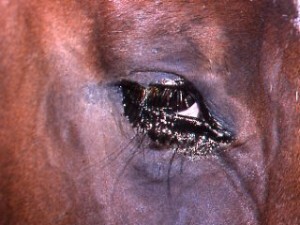 Medical Editor Matthew Mackay-Smith answers an EQUUS reader's question about lumps around the eye and discusses careful management of sarcoids and melanomas. Question: A small bump recently appeared near my 1 1/2-year-old gelding's left eye. It doesn't seem to bother him when I touch it. What is it, and could it pose a problem in the future? Foreign body reactions (usually from a splinter or thorn tip). Tiny penetrating objects can get trapped in the skin. Because of the abundant circulation near the eye, they may get "sterilized" by body defenses without the usual infection and pus such items can cause elsewhere. The penetrant usually leaves a faint mark where it pierced the skin. Sarcoid. This viral tumor is slightly contagious. It often seats near the eye, perhaps inoculated by a fly or into a fly bite or slight abrasion. Most are hair covered and slow growing and pose little problem for several years, at least. A few grow or multiply enough to need treatment, which may include freezing, radiation, surgery or immune stimulants, alone or in combination. Melanoma. This black-cell tumor is common near the body openings of gray horses, less so in other colors. Like a sarcoid, it usually grows slowly and needs one or more treatment approaches when and if it starts enlarging significantly. The key to small lumps is to watch them carefully, measure them with a ruler or caliper once or twice a year and record the size. Then, if you notice a growth spurt, you can get timely treatment to avoid disfigurement.